One thing that is useful now and again when you are testing different problems and configurations on Exchange is to have a Mail client that isn’t Outlook or OWA. Back in the days there used to be a Simple Mapi client called the Exchange client which disappeared after 5.0. While this isn’t a attempt to replace it or to be an end user mail client at all it’s a great little test bench script that allows you to get in and look at mailbox and the items in that mailbox, Download attachments,export single emails, look at Message headers, search for emails and if there is any particular problem you want to tackle in regards to certain properties it’s something that can be very easily adapted to fit an specific problem. 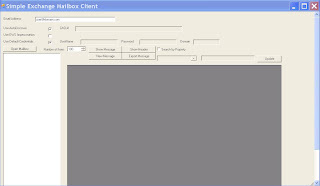 This script presents a Winform GUI that allows you to interact with a mailbox and present it into a displayable view back to a user. Okay I could go on like this all day (seriously!!) this is actually what it looks like when you fire it up. Use default credentials means the script will try to use the currently logged on user when accessing the mailbox otherwise you can fill in the credential settings. When you hit the open mailbox button the script does a Deep folder Traversal starting at the Mailbox root and then builds a foldertree of the result. An event is added to the folder tree so when you click any of the leaves it will fire an event that then does a Findfolder operation to retrieve items from the selected folder. It will only return the number of items listed in the number box which is 100 by default so if you where to click the inbox it will only return the first 100 items if you want it to return more or less you need to change this number value. The search functions allow you to refine which items are returned or you can create different searches based on From, Subject and Body it does a Substring search when you select each of these properties. The search works by building the correct searchfilter string based on the dropdown value you select and the text that’s entered in the text box. The ShowMessage button does a Get-Item operation and retrieves the message and body as Text and displays the result. The Show header lets you look at the Message header and the download Attachment and export message allows you to download message and attachments which I've described in another post here. There is really on two requirements for this script the first is you need the have the EWS Managed API installed which you can download from here.The only other requirement is to have Powershell. I may not use this GUI for my own uses, but the code you have provided opens up so many possibilities and provides so much clearer understanding of the EWS and some of the nitty gritty of getting it to function. I really appreciate you and your blog for all the hard work you do and the great sharing of information you provide. I'm a beginner and you will really help me with your code and your blog! Thanks! You're a genius! Note "1.1" instead of "1.0". New version of the EWS API. Note "2.0" instead of "1.1". New version of the EWS API.